Webley's airgun history began in 1910 when an interesting air pistol, with an in-line spring piston and barrel, was designed and patented by William Whiting, then director of Webley & Scott. At least one working example was constructed, but the gun never went into production. The first production Webley airgun was the Mark I air pistol designed by Douglas Johnstone and John Fearn. It was patented and appeared in 1924 and became an immediate success. Like the Webley & Scott firearms, these pistols were built of interchangeable parts of superior quality and the designs were internationally patented. In these new pistols, placing the barrel over the spring chamber allowed a relatively long barrel in a compact gun. The Mark I was soon followed by a target model, the Mark II Deluxe version. A smaller air pistol, the Junior, was introduced in 1929 to give younger shooters a more economical version. It had a smoothbore barrel for firing reusable darts for economy of use. These young users soon were eager to acquire the more advanced Webley models. Shortly after the Junior air pistol had been launched, Webley & Scott brought out the more powerful Senior air pistol which established a basic pattern for future manufacture. Its improved method for cocking the air chamber piston, plus the use of the stirrup barrel latch, now a Webley hallmark, contributed to the enduring popularity of the design. so many guns - so little time , why am i even thinking of air guns ? Interestingly the design was basically unchanged up through the 1990's! Holy cow! This is a whole different avenue of collecting I never realized before! I think Hoadie has a Senior? The early models were the Mk1, Mk2, Junior, Senior & Premiere. The newer "stretched" versions I recall were the Typhoon, Tempest & Hurricane. The earlier guns were blued steel, but the later were painted aloy, so to purists the older guns were "better". IMO the old leather pistons were a pain & the newer ones with the synthetic were actually better internally. I think (I may be wrong) the Stinger & Nemesis were Webly in name only, made in India with the Webly brand name after it was sold? I like that !!! Im looking into a nice little CHEAP breach loading air pistol .. something to shoot darts out of , crossman used to sell one years ago ... just want one to shoot darts at a dart board !! Get a smooth-bore for darts. It will end up with no rifling anyway! Yea, thats what I was thinking about .. crossman makes a cheapie that is smooth bore !!! WOW! 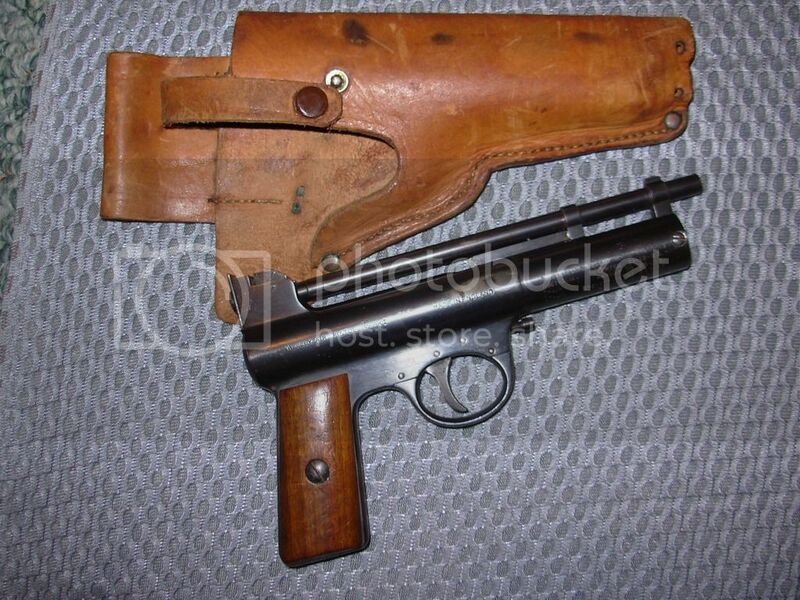 that IS early, it doesn't yet have the stirrup latch for the barrel!